The meeting at Chelmsford on Friday is well subscribed and the final race on the card, the Totepool Betting at Totesport.com Handicap (7.55), a 16-runner, Class 6 affair, looks just the race for us. Glorious Dancer has a 100% record at Chelmsford, having won a small 0-75 contest over a mile last February, off a handicap mark of 66, when with Ed Walker. 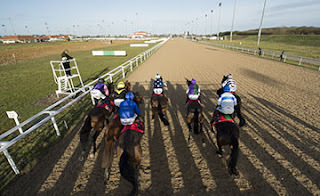 He has yet to trouble the judge in six starts on Polytrack for Lee Carter, but has consequently tumbled down the weights and looks well handicapped if the return to the Essex track sparks a revival. He’s bred to be a sprinter and his two previous attempts beyond a mile were less than awe inspiring, but he would have a squeak if anywhere near his best. Angel Of Light finished last on her first two starts in maidens at Wolverhampton and Bath in April and showed only minor promise when eighth of 13, beaten 14½ lengths, behind Mazaz in a similar race on her return to action at Kempton last month. Nevertheless, she’s by the excellent young sire Dark Angel, starts life in handicaps at a lowly level and is the only unexposed runner in the field. Trainer Jo Hughes is only 1-14 at Chelmsford in recent years, but jockey Pat Cosgrave is 1-4 for the yard on the all-weather, so Angel Of Light could find the necessary improvement. Rainford Glory is 2-33 on the all-weather and hasn’t won a race of any description for over a year, but is 5lb lower in the weights than when winning at Redcar last October and shaped with some promise when fourth of 12, beaten 4¼ lengths, behind Mr Frankie at Wolverhampton last month. All of his wins have come at 1 mile 2 furlongs or further, so steeping back up in distance appears in his favour, especially if the first-time visor has the desired effect.